Search our online database of collections here. Like many local historical societies, the Arlington Historical Society was founded amidst a period of exponential change. Rapid residential development in the mid to late 1800s was changing the face of what had been a quiet agricultural town. Arlington was swallowed up as part of Boston’s inner suburb, with increasing numbers of newcomers dramatically changing both the landscape and the culture. Another facet of growing interest in preserving local historical knowledge was the arrival of the U.S. Centennial, when many long-time residents were examining their story of a Revolutionary past and wished to share that proud history with others. The Society was officially organized in 1897 and began collecting historical manuscripts, images, and objects which were then housed in a local library. In 1923 the Society acquired and restored the colonial era home of Jason Russell. Thanks to the generosity of donor George Abbott Smith, an accumulation of turn of the century structures that hid the Jason Russell House from view were purchased and demolished in the 1960s. The Smith Museum was completed in 1981, providing vital exhibition and storage space. Extraneous objects from the Jason Russell House, as well as objects housed in expensive off-site storage, were moved to the Smith Museum. Object Collection includes: Material culture collections from 18th century to present including a large proportion of textiles, furnishings and household implements, militaria and collections related to the Revolutionary War. The Jason Russell House itself is often considered a crucial part of the Society’s collection. There are 4,548 objects. Archives include: Archives of the Society, manuscripts, diaries, correspondence, deeds and other primary source records of town history and residents, maps, architectural plans, ephemera, audio and visual recordings. There are 3,638 items in the archives. 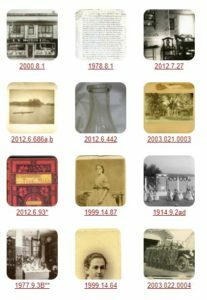 Photographic collections include: Various types of historic photographic prints, negatives, and a large collection of lantern slides. There are 4,368 items in this collection. The Library includes: A collection of antique or rare books; it is housed along with our Archival collections. The Library also includes common published texts relevant to Arlington History. There are 1,351 books in this collection. To learn about selected items from our collection, visit our online database, blog or our online exhibits. Visit our new online collection! The Jason Russell House and Smith Museum are open Saturday and Sunday 1 p.m. to 4 p.m. from Patriot’s Day (mid April) to Columbus Day (mid October). We love visitors! Directions, hours and admission information is here: Visitor Guide. Your generous, tax-deductible donation helps support the Jason Russell House, the Smith Museum, and the ongoing mission of the Arlington Historical Society. You can donate online or by sending a check: Donate.